Buzzdome.com is an Internet company depicted in "Sappy Anniversary." Buzzdome hires Jake Morgendorffer for a brief period but then fires when he blows an important presentation—and then rehires him as a consultant, giving him back his old job. Buzzdome presented a variety of interesting characters: the 24-year-old ultra-rich president, Noah Barkman; redheaded Nora the information architect; Zhengdong the interactive strategist; Sameer, the "brain trust"; and the maladjusted consumer-service rep, Jackleene. All of them were throwing around vast amounts of money on fancy possessions. It took everyone at Buzzdome.com a while to realise Jake knew nothing about computers, initially believing his dated references and confusion were jokes. He got on well with the staff though, and while they fired him as a worker they hired him as a consultant who could show them what middle-aged technically illiterate men wanted. The correct spelling of Sameer and Zhengdong's names was in dispute until Anne D. Bernstein revealed them in an email to Kara Wild. 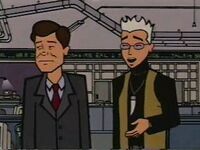 President of Buzzdome, a dot-com millionaire who hires Jake Morgendorffer in the episode "Sappy Anniversary", noted for being a dynamic personality and speaking in a stream of confusing buzzwords & jargon. When Jake enthusiastically spouted jargon back, Noah assumed he was hip to the industry (and only worked out he wasn't when Jake became visibly nervous during a presentation); he liked Jake and found his excitement reminded him of his own beginnings, and quickly re-hired Jake as a consultant after firing him. He turned 24 shortly before the episode. He spent Buzzdome.com's early days on late-night code-crunching sessions, fuelled by coffee beans and sleeping on the carpet. Noah is voiced by Kiki Barrera a.k.a "Sydney Perez" in the credits of Sappy Anniversary. The information architect for Buzzdome, part of Jake's "work node." Redheaded Nora wears braces on both arms around her wrists from carpal tunnel syndrome, and she cannot shake hands as a result. She's willing to spend $6000 on coffee tables. The "brain trust" of Buzzdome. Sameer appears to be Indian or Pakistani. A very affable young man, Sameer tells Jake in secret that he doesn't know what he's doing at the company but plays along that he does to get paid. The interactive strategist for Buzzdome. Zhengdong appears to be of Chinese ancestry from his face and his name. He was interested in buying an authentic Batmobile with his earnings from Buzzdome when he met Jake. Zhengdong was voiced by Scott Williams, who also voiced Wind Lane, Bing, and Cupid. Jackleene was the company's sales representative. Highly acerbic and aggressive, she tended to berate any customer that complained they were having problems and questioned whether they had the right software. Buzzdome.com doesn't often appear in Daria fanfic. One example is The Angst Guy's "A Knight to Remember", which postulates that the company was swept away in the so-called dot-com crash in 2000, and offers possible reasons for that. Zhengdong is given the main role and shipped with Monique. Noah Barkman is the organizer of the "Cannonball Run" race featured in DJW's story, The Dammitall Run. In the serial God Save The Esteem, Erin, and later Jodie, are hired to work in the company. Daria, Buzzed Up and Sold Out? by EntrancedCat merged "Sappy" with "Is It College Yet?" and had Daria interning at Buzzdome over the summer before it all starts to go wrong. Fanfics may spell Sameer as Zameer and Zhengdong as Xiangdong, if they were written before spelling was revealed. Anne D. Bernstein, writer of "Sappy Anniversary", uses Buzzdome.com as the name and address of her own website. "The Daria Temporal Analysis Project" by Richard Lobinske, which places "Sappy Anniversary" before the dot-com crash. January 2006 interview with Anne D. Bernstein on DVDaria that discusses Buzzdome from her viewpoint as the episode's screenwriter. The url buzzdome.com redirects you to Anne D. Bernstein's homepage. This page was last edited on 3 May 2018, at 20:54.